The Liddy Shriver Sarcoma Initiative is pleased to partner with Solving Kids' Cancer to fund pediatric cancer research. This year, the two organizations worked together to host a special event in New York City. Check out the press release! This event took place on September 9th in Manhattan at the City Winery at 155 Varick Street. 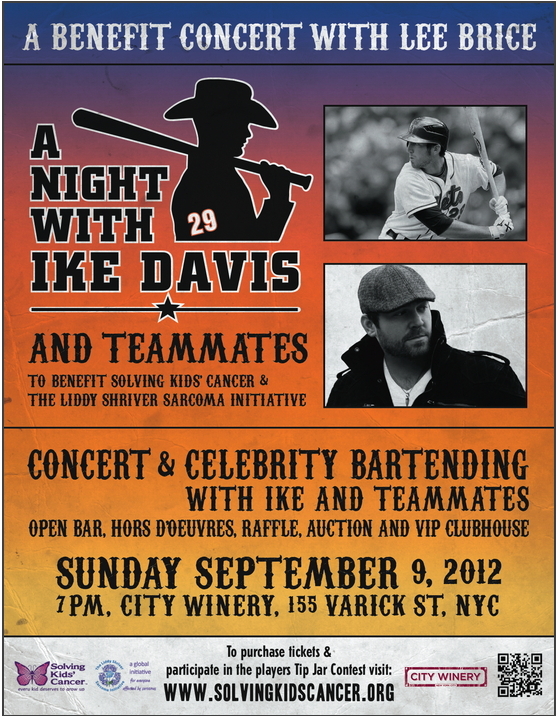 Ike Davis and his teammates tended bar and mingled with the crowd while country singer Lee Brice gave a concert. Those who were unable to attend the event can show their support by donating directly to pediatric sarcoma research on this page. Donors will receive e-mail receipts for their tax-deductible donations. The Liddy Shriver Sarcoma Initiative works to award sarcoma research grants to expert investigators around the world. Sarcomas make up about 15% of children's cancers, and research is critical to improving the lives of these children and their families. The Initiative maintains an extremely low overhead of 2-3% per year. Thus, 97-98% of donations go directly to support sarcoma research. Our partners and champions work with us to raise much-needed funds and can choose to target those funds toward research on pediatric sarcomas or on specific types of sarcomas.